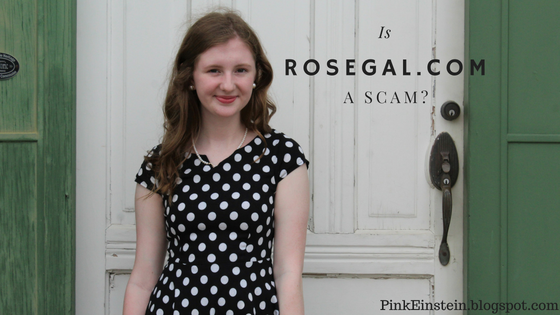 Life as Pink Einstein | Dallas Fashion and Lifestyle Blogger: Is RoseGal.com a Scam? Recently everyone has been trying out online store such as SheIn and RoseGal because the prices are so good but one of the questions you have to face when purchasing from a website like that is 'is it reliable?' Many bloggers and YouTubers have reviewed SheIn so I thought I would share my experience shopping on RoseGal.com. Back in December I purchased four dresses from RoseGal and I would have shared about them earlier but they weren't exactly weather appropriate up until now. All of these dresses are from their "Vintage Dresses" collection and they are just darling! In case you want to shop these dresses I have linked them at the end of the post. Dress 1 // This dress is so pretty! The pattern on it reminds me so much of spring time and it's also perfect for church. It fits like it was tailored to me and I'm also comfortable in it. The dress hits just below the knee, zips up the back starting from the waist, has a sweetheart neck line, and an empire waist. Dress 2 // I love this dress, I feel like I should be wearing some fun red heels and a red lip! I was having a hard time finding this dress on their website so I linked a very similar one below, the only difference is the neckline. This dress looks just like the picture, is amazing quality, and fits true to size. This A-line dress has cap sleeves, zips up the back starting at the waist, and hits just above the knee. Dress 3 // How fun is this dress! I feel like I'm in a movie from the 40s when I wear this dress! I love the light blue and white polka dot pattern of the dress and the collar has to be my favorite part. This dress hits right below the knee, zips up the side starting from the waist, has a v neck, and an A-line silhouette. I have nothing bad to say about this adorable dress! Dress 4 // Of course I love this dress, its navy. This dress is so simple yet so pretty. I love wearing it to church with a set of pearls and a pair of flats. The A-line dress hits above the knee, has cap sleeves, and zips up the back starting at the waist. Linked below is a similar dress, the only difference being the neckline. This dress is exactly as the website pictured and I have no complaints. Overall, I have zero complaints about the website. A few of my family members have purchased items from RoseGal and they have loved them all, none of the items have been anything but what they ordered and there was no issues with payment either.